Handmade bright Talavera tile design “Aldama” was created to adorn terraces, stairwells, kitchen counters, bathroom walls and showers. 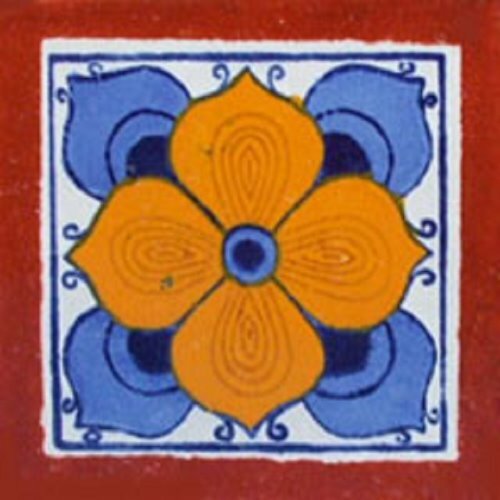 Painted in yellow, blue flower pattern against a terracotta background, this Mexican tile gives you freedom of combining it with other vivid colors and creating your own unique interior or exterior style. Free shipping to the US. I already had similar design Mexican tiles in my bathroom and decided to cover a counter with them. The only problem was that my tiles were purchased during my trip to central Mexico and I was unable to locate exactly the same pattern online. Well, I did find it but the tile color were different. I needed Aldama design with green border and I am glad I found mymexicantile company. They ordered the tiles according to my specifications and delivered to California in no time. Thanks again and I will be using this side in the future.